"A thick-rimmed steering wheel swings a set of Michelin Pilot Super Sports that are attached to an AMG-exclusive front suspension. (The Michelins are fitted out back, too, of course.) Assist effort changes depending on which of the four driving modes are selected. In any mode, the steering has direct feedback and reliably reports the distress of the Mercedes-spec rubber—a distinct advantage over the M3. Front-end grip is strong, even on track. 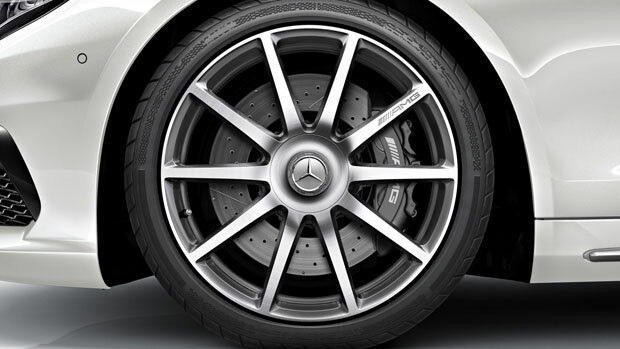 The AMG’s front stance is wider than the standard C-class, and while the rear suspension retains the C-class architecture, it’s tuned specifically for the 63. (The rear end also features a limited-slip differential.) A three-mode electronically controlled suspension varies the damping in degrees that range from firm to harsh. But even on the 19-inch wheels that come on the S version, the ride is better than that of the old C63." "On the outside, the AMG version has wider front fenders with subtle flaring and a menacing gape below the front bumper, yet it can’t match the aggressive look of the old C63 and its strakes, slats, and flares. But despite the old car’s meaner countenance, the new iteration is definitely angrier. Indeed, if the 2015 C63 attended any anger-management sessions, it only went to one, stayed for perhaps five minutes, threw a chair through the window, and stormed out. This makes us very happy." "When it comes down to it, a performance sedan of the Mercedes-AMG C63’s caliber needs to be able to deliver on track; the BMW M3 and M4 duo certainly do, and the Cadillac ATS-V looks like it might just be the overdog. Audi’s S4 may do some battle with the base C63 (non-S-model), but it doesn’t really have a contender without an RS 4. Fortunately for AMG, the C63 S delivers with an abundance of nearly everything. Power? Check. Rear-drive balance? Double check. Surprisingly good steering? We’re headed toward plaid. 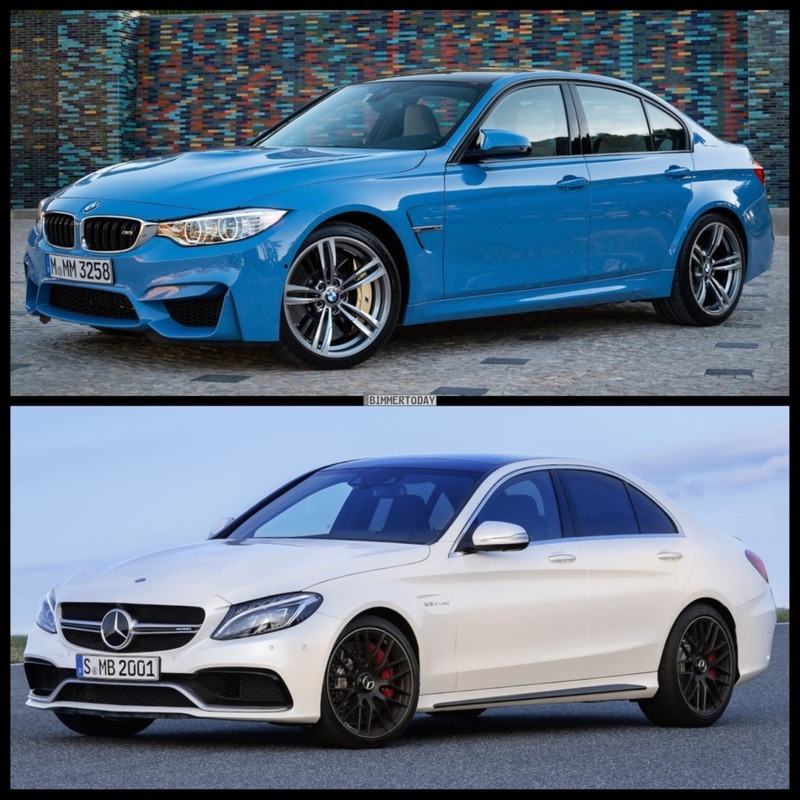 Comparing the C63 S to its nearest natural competitor, the BMW M3, is perhaps one of the most enlightening revelations for the brand-agnostic performance enthusiast: where once the BMW would have had the superior ride quality, steering feel, and sport seats, the pendulum has swung completely to Mercedes-AMG’s side. Where the BMW feels leaden and lifeless (read: anything below about 100 mph), the C63 S feels lithe and limber. Above 100 mph, both cars are a joy to drive, but the BMW still feels more like a surgeon’s laser scalpel, while the C63 S is a back-alley switchblade—in hoonistic respects, at least." Looks like the regular c-class. Not necessarily a bad thing, just not all that aggressive looking. Maybe it needs a lighter color to show off the aggressive cues? Sounds like a banshee! And those seats look real nice. Ugh.. Ugly Merc for a AMG model. Both the ATS-V and especially this new C63 AMG are going to make comparisons against the M3 to be a hell of a lot more interesting. Having said that, the M4 winning over the RC F and RS5 isn't really anything to write home about. E, my bet is that the new C63 will edge out the M3 in the majority of the upcoming comparison test. The engine, interior design/materials and exhaust note will be what tips the scales in favor of the Merc. While I agree, saying that around here is likely to get you shot..
No, you use a tool to remove the center hub cover which exposes the lug nuts. Last edited by EKaru; Tue, Feb-24-2015 at 01:27:54 AM. All times are GMT. The time now is 06:56:51 PM. Discussing Chris Harris Drives The New W205 C63 AMG in the Off Topic Forum - Place to discuss this and that. Note: We also have "request to join" forums: Guns and Fitness.